Filet Mignon steaks are cut from the beef tenderloin, which comes from the middle of the steer’s back. This muscle spans into two beef primal cuts, the short loin and sirloin. It starts just past the last rib of the steer and ends in the sirloin right before the rear leg. The beef tenderloin is oblong in shape and tapered at one end. This muscle does very little work and is non-weight bearing, which is why it’s very tender! 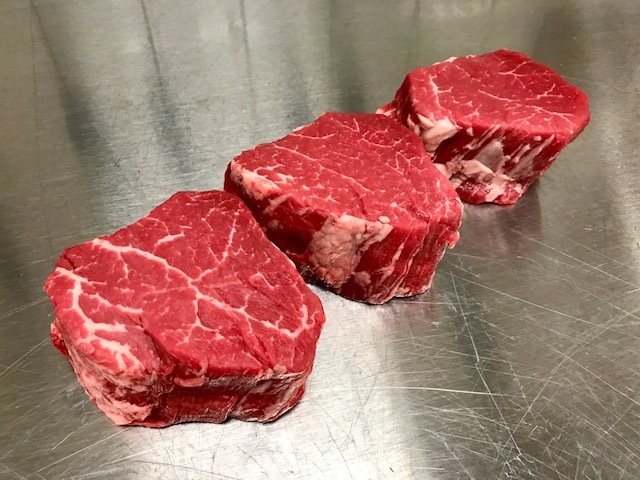 A fully trimmed and tied beef tenderloin will weigh between four and six pounds, and will yield eight to twelve 8-ounce filet mignon steaks approximately 1½-inches thick. Filet mignon steaks are the most expensive, tender, and desirable cut of steak. 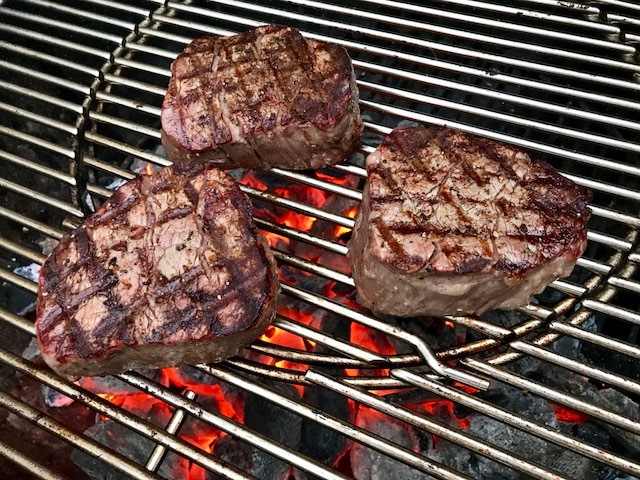 It might sound a little intimidating to grill these delectable steaks at home, but let me tell you, it’s a steak that you will go back to again and again! Season well - Filet mignon steaks have little fat, which means little flavor. They are very tender but you need to season them well. My favorite way to season a filet mignon steak is with Fleur De Sel sea salt and fresh ground Tellicherry black peppercorns. For a little extra flavor, I’ll smear bacon fat on them instead of brushing them with oil. Bacon fat will give them a hint of smokiness, and will help you achieve a great sear on the steak. Buying filet mignon - Go to your local butcher. They will never give you a bum steer!! OK, seriously, you need to look for modest marbling, well-trimmed, nice bright red color, and no silver skin on the steaks. Make sure all the steaks you are buying are the same thickness to ensure the same grilling time. Cooking time and temperature - Remove filets from the fridge, lightly brush with olive oil, season them up, and allow them to get close to room temperature. Prepare your grill for direct cooking over high heat (450° to 550° degrees). Once the grill has preheated for about 15 minutes, use a grill brush to clean the cooking grates. Grill your filets over direct high heat with the lid closed as much as possible for 6-8 minutes, turning once. Move the filets over to indirect heat for an additional 4-6 minutes or until your desired degree of doneness. I enjoy my filets medium rare, 125°-135° degrees. Use a Weber iGrill app-connected thermometer to ensure perfect results every time. You don't want to overcook this special cut of meat! 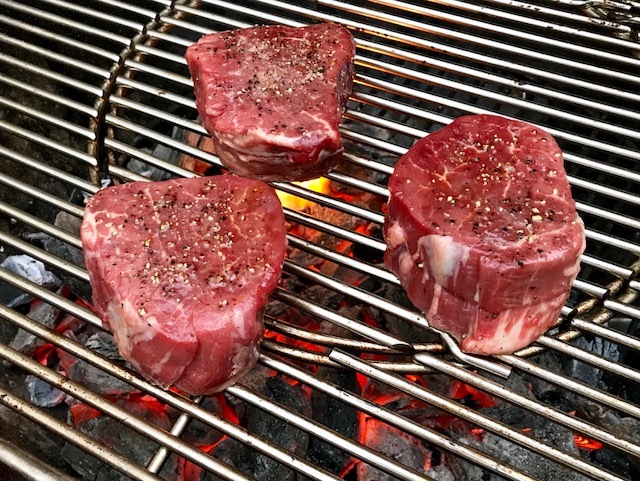 Remove filets from the grill, and allow them to rest for a few minutes to allow the juices to reabsorb back into the filet instead of spilling out all over your place. Can be hard to find at a typical grocery store. Try special order or visit your local butcher shop. Yes, they are expensive, but grilling filet mignon at home is a fraction of the price than eating at a steak house! Happy Grilling! Think a good filet is better with a strong martini? Check out this recipe for Martini Marinated Filets. Want to seriously impress your guests? Look no further than this steak house classic. 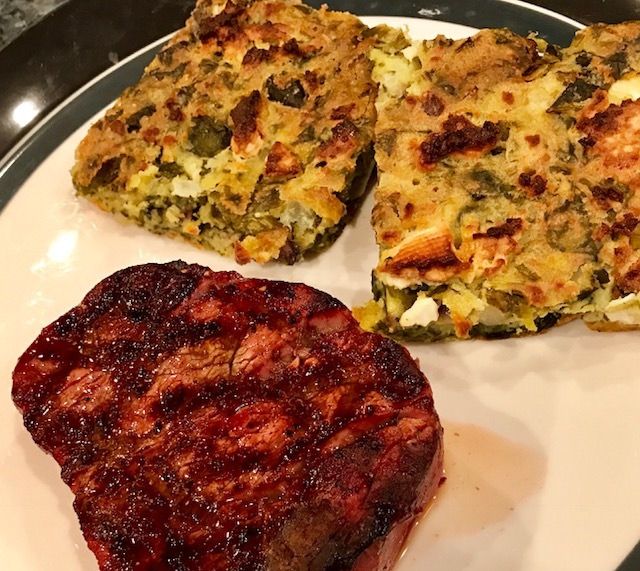 Want grilling guides, tips, technique and awesome recipes delivered straight to your phone? Download the free Weber Grills app today. Quick Tips to Get Ready for BBQ Month!